Prostate cancer is one of the most frequent malignancies among older males. It remains a primary cause of cancer death in men in many developed countries. The American Urological Association recommends prostate cancer screening for all men ages 55 to 69 years. The PC3 cell line was isolated from the bone marrow metastasis of a 62-year-old Caucasian male with prostate cancer after androgen suppression therapy. PC3 is the classical and well-studied cell line extensively employed for human prostate cancer research. PC3 cells exhibit high metastatic potential. A 2016 study by Li et al. published in Biological Research investigated the role of recombinant trichosanthin (rTCS) on prostate cancer cells PC3 in vitro and in vivo using the PC3 xenograft model. rTCS inhibited proliferation of PC3 cells in a dose-dependent manner and decreased tumor volume weight significantly. IL-2 enhanceed the inhibitory effect of trichosanthin on PC3 cell, overall suggesting that the combination of IL-2 and rTCS could be used as a potential therapeutic strategy for prostate cancer patients. Rij et al., in the Journal of Nuclear Medicine (2018), used the PC3 xenograft model to characterize the efficacy of hRS7, a humanized iGG1 monoclonal antibody against EGP-1/TROP2, for treatment of prostate cancer. 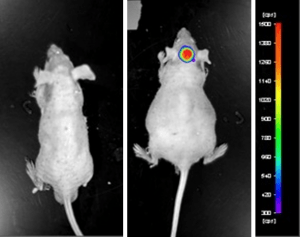 The group used a radiolabeled antibody for radioimmunoimaging techniques including PET and SPECT in order to examine histology and concluded that this technique was able to successfully selectively target prostate tumor cells. A 2017 Nature study conducted by Gui et al. also used the PC3 model, but to characterize the anticancer effects of Litchi, or Chinese Cherry, on prostate cancer. This study used n-butyl alcohol extract from the Litchi seed (NLS) to treat PC3 cells; results showed apoptosis induction, cell cycle arrest, decreased invasion and migration, a dose-dependent inhibition of cell growth and viability as well as inversion of epithelial to mesenchymal transition (EMT) mediated by Akt/GSK-3β. Overall findings promote the use of NLS as a safe prostate anti-cancer treatment. Lastly, a 2003 Molecular Therapy article by Galaup et al. 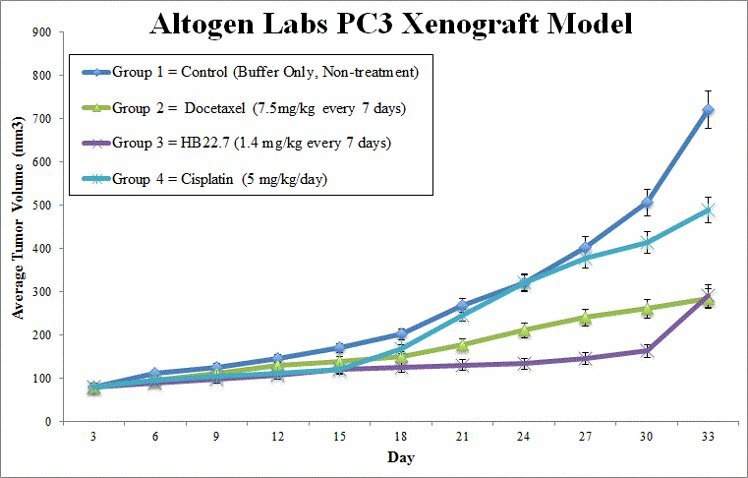 used the PC3 xenograft model to evaluate combination therapy of angiostatin and docetaxel gene therapy. The study treated tumors with adenovirus-delivered angiostatin (AdK3) and docetaxel; results demonstrated that tumor regression was only observed with combination treatment and was correlated to a decrease in vascularization. This has clinical relevance of highlighting the importance of combination therapy in the case of these two drug targets. The PC3 cell line (human prostate) is used to create the CDX (Cell Line Derived Xenograft) PC3 xenograft mouse model. The PC3 xenograft model is an androgen-independent model used for preclinical assessment of tumor growth inhibition by statins (e.g. simvastatin) or chemotherapies (e.g. docetaxel, fluoropyrimidine F10). Exponential growth is maintained for PC3 cells prior to injection. Trypsinization is used to collect the cells, followed by typan blue (viability) and cell counting. The suspension concentration is diluted to 10,000 cells per microliter density. 11-12 week old nu/nu mice receive a single s.c. injection. All injections are into the hind leg flank, and contain Matrigel plus PC3 cells. Tumor measurements are assessed using calipers (digital). Upon reaching averages of 50-150 mm3, animals are grouped into necessary number of treatment cohorts. In-life administration of all test compounds are performed by following the client supplied treatment schedule. Continual tumor measurements (daily) and whole mouse body weights are recorded. Final tumor measurements and euthanization occurs when tumor size reaches 2,000 mm3 or a predetermined limit per IACUC protocol. Excised tumors are weighed and documented (digital imaging). In preparation for downstream analysis, tumors/tissues are snap frozen in liquid nitrogen, stabilized (RNAlater) or prepared for histology analysis (10% NBF).